Lube Swage lube reduces friction, preserves die finish; a thin film for each stage. 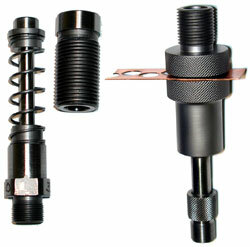 Press Precision alignment, high power, self-ejection, plus reloading capability! Dies Standard or custom shapes, calibers; your imagination is the only limit! Cores Lead wire or core moulds, lead or lead-free: it's up to you! 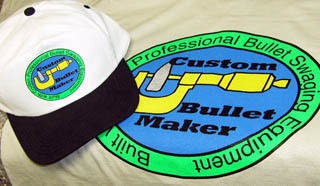 For a quick look at all the swaging products available, browse the Corbin Web Store at www.SwageDies.com. You will find pricing, pictures, and a brief description of each item. Put items in your "shopping cart" to make a quick quote. For printed literature, instruction folders, price list, and free E-books, browse www.Swage.com, our document server. Specify the caliber (diameter), the shape, and an approximate range of weights. The weight is adjustable with broad limits. Jackets (not shown); specify caliber, length. 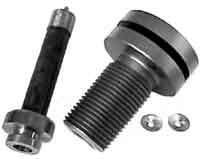 Every kind of bullet uses Corbin Swage Lube in the swaging process, to prevent sticking, reduce wear, and lower the forming and ejection pressure. Therefore, any "kit" you build will start with CSL-2 (or optionally, larger sizes such as CSL-16, pint size). The press you need depends on (1) largest caliber, (2) hardest material, and (3) longest bullet you plan to make. 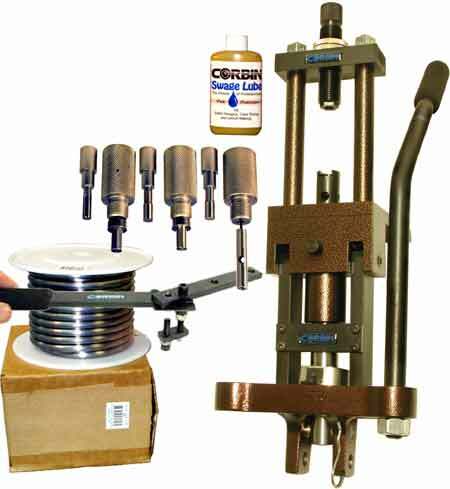 From .12 to .458 caliber, with material not over Bhn 10 hardness (wheelweight or softer lead), and bullet length of 1.3 inches or less, you can normally use the Corbin CSP-1 S-press or CSP-1H Hydro-Mite press. These presses use Corbin type -S dies as well as standard reloading dies. 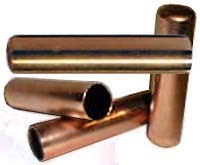 For calibers from .172 to 1-inch cannon (25mm), with material hardness decreasing with increased diameter from Bhn 12 to Bhn 5, and bullet length not over 2.5 inches, you can normally use the Corbin CSP-2 Mega Mite press (complex finned bullets requiring greater pressure early in the stroke or bullets that need a stroke longer than 3 inches are exceptions). For any caliber, any ductile material of reasonable hardness or powdered materials (solid copper may require pre-drilled center hole), and any reasonable bullet length, you can normally use the CHP-1 Hydro-Press. (Corbin builds custom remote control presses for up to 40mm artillery assembly/disassembly, restricted to US DOD applications). The core needs to fit either (1) the I.D. of your chosen jacket, or (2) the bore of the die for lead bullets. Serrator Dies. These come in two types, full length (SDD-1) or ogive only (SDD-2). The full length type cuts fine grooves in the OD of the jacket and then irons the ridges raised by this furrowing operation back to size again. The ogive-only die is more complex: it serrates the jacket after the core is seated, and ejects the jacket back out again, so a variable length of the nose section can be serrated. Jacket Trim dies come in two types, the ET-1 adjustable trimmer, and the ET-2 automatic ejecting trimmer. The ET-1 has a somewhat wider range of adjustment for length, but is somewhat slower to operate. The ET-2 is faster to operate, but is tailored to suit a somewhat less wide range of length adjustments. Both are used to make shorter jackets from longer, drawn jackets. Cannelure Tools place a precise cannelure or serrated groove around the bullet, or can be used in the Lead Knurling or Grooving Tool variations to place lubrication grooves or knurls on lead bullets. Both hand and power machinery is available from Corbin. New Products: Corbin is constantly developing new products for bullet makers. You might want to review the list of press releases to see if there is anything else you'd like to add to your kit, then use your browser "back" option to come back here and finish assembling your kit. Choose your accessories, look up the price in the PRICE LIST , and add to your kit price. Start with the menu at the top of the page, and go down the numbered list, starting with 1. Click on the numbered line to jump to that topic, read the information presented, and decide which option you want. Click the option to jump to the pricing. If further options are offered, decide which you want and write down the price. Then click the price to jump to the next step. If you want to read more details and see illustrations about an item, instead of clicking the price, click the description or picture in the left-hand column (prices are in the right-hand column). When you've finished reading about the item, click your browser's "back" button to get back to the kit selection menu, and continue "building" your kit. When you have configured all items in the menu and have the prices, you can send us an e-mail listing the items you want, and send your bank card number and expiration separately using our secure server shopping cart (look for the option listed on it, called "information", which is a way to safely send your bank card info without ordering anything on the server list). When we receive your e-mail, we'll reply with any suggestions that might save you money or correct any possible errors in the order, and make sure it is OK to ship the order. Don't worry about accidently ordering the wrong thing: we'll check it out and make sure we understand what you want before shipping.